This post is sponsored by the German Book Office New York. Geisteswissenschaften International is a translation grant that annually awards 600,000 euros to fund the translation of German-language academic works into English. Partners include the Börsenverein des Deutschen Buchhandels, the German Federal Foreign Office, the Fritz Thyssen Stiftung and VG Wort. Titles are selected by an independent jury of academics, trade journalists and academic publishers. You can find out more about Geisteswissenchaften International and the previous years’ winners here. 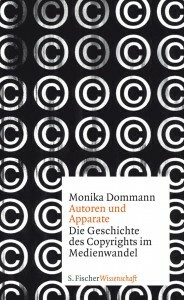 In her book, Authors and Apparatuses, Monika Dommann explores copyright history in the USA, Germany, France and Great Britain from 1850 to the present, using case studies and real-life examples. Her book demonstrates that the new challenges to copyright in the digital age are really the same problems faced by authors and rights holders over a century ago.